Can portability and performance coexist in one Ultrabook? A short battery life and an obnoxious amount of bloatware hold back this otherwise excellent notebook that tows the line between Ultrabook and gaming laptop. Laptops fall into neat categories. The 11.6-inch notebooks stay small and affordable, the Ultrabook sits at the higher-end spectrum of mobile computing and anything 14 inches and up is represented with budget or gaming laptops up until you get to the 17-inch mobile gaming rigs. For the most part, there's no deviation from this mold, other than 2-in-1 laptops like the Lenovo Yoga 2 Pro. Like I said, for the most part. Enter the Acer Aspire V7. It's an interesting 14-inch notebook that splits the difference between a Ultrabook and larger gaming machines like itself. 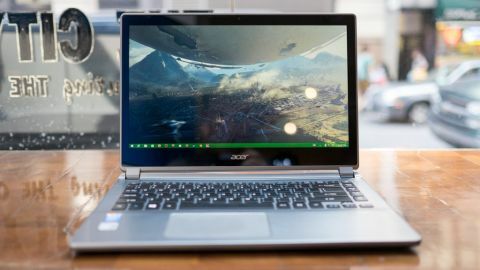 Acer has not made any allusions to it's laptop being perfect for both use cases; instead, the Aspire V7 is just barely a gaming machine and just barely an Ultrabook. Basically, this is a slimmed down, 14-inch laptop equipped with a vivid 1080p touchscreen and Nvidia GT 770M graphics card, whereas most Ultrabooks would forego including a dedicated GPU. Has Acer hit the right balance between portability and power, or does the Aspire V7 suffer an identity crisis? Compared to other ultraportable notebooks, the Aspire V7 is one of the most plasticky machines around. Users won't find any Gorilla Glass, as with the company's high-end Aspire S7 Ultrabook or the Samsung ATIV Book 9's metal casing. Measuring 0.9 inches thick, the Acer is also considerably thicker than the exquisitely thin 13-inch MacBook Air and all the other wedge-shaped laptops it has inspired. It's obvious the Aspire V7 won't win any beauty pageants against premium Ultrabooks, and I wouldn't expect it to with its much lower price, starting at $799 (£469 or AU$1,299) Despite the all-plastic frame, the V7 is still a very attractive package. The chassis does not creek at all under the full weight of your palms, or as your fingers tack away on the keyboard. Acer has also nimbly avoided using the oft-used plain plastic by giving both the laptop lid and keyboard deck with a brushed aluminum-like finish. Even the underside looks and feel good, thanks to a rubber bottom. The rubberized underside also helps keep the laptop firmly planted on desks and feels softer on bare knees. Aside from the surface details, Acer has sculpted the V7 with gently curved edges. Most notably, you won't feel like your wrists are cutting into the laptop's gently rounded edges. Elsewhere, the palm rest flows smoothly into the slightly sunken in keyboard before another curve caresses upwards to meet the display. They're all minor aesthetic touches, but taken as a whole, there's a consistent look you'll appreciate about the Aspire V7. Around the back of the laptop you'll notice it's a bit thicker and this is to make way for a video output ports as well as a USB 3.0 and ethernet jack. Some users might not appreciate this port placement, but it's perfect for those using the Aspire V7 as their main work computer. Users will be able to plug in the laptop to a monitor on their desk and USB hub while keeping the cables tucked away and hidden behind the screen.